Today's coincidence story follows the Yellow Brick Road and takes us back in time to the late 1930s. 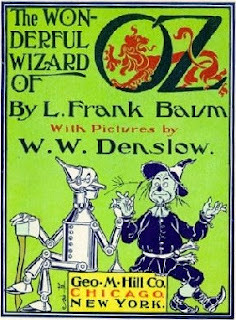 A movie was being made based on the children's novel The Wonderful Wizard of Oz by L.Frank Baum. The movie became simply the Wizard of Oz starring Judy Garland. Frank Morgan played five roles: Professor Marvel, The Wizard, Doorman, Cabbie and a Guard. For the part of Professor Marvel the wardrobe department decided they wanted something with the quality of 'seedy gentility'. To meet their needs they headed to the second-hand stores where they chose several jackets that seemed suitable. On set a jacket was chosen from the selection and Frank Morgan tried it for size - it looked perfect. Now comes the weird bit. For some reason Morgan turned one of the pockets of the chosen jacket inside out - no idea why, but what he found was a label with the name 'L.Frank Baum'. 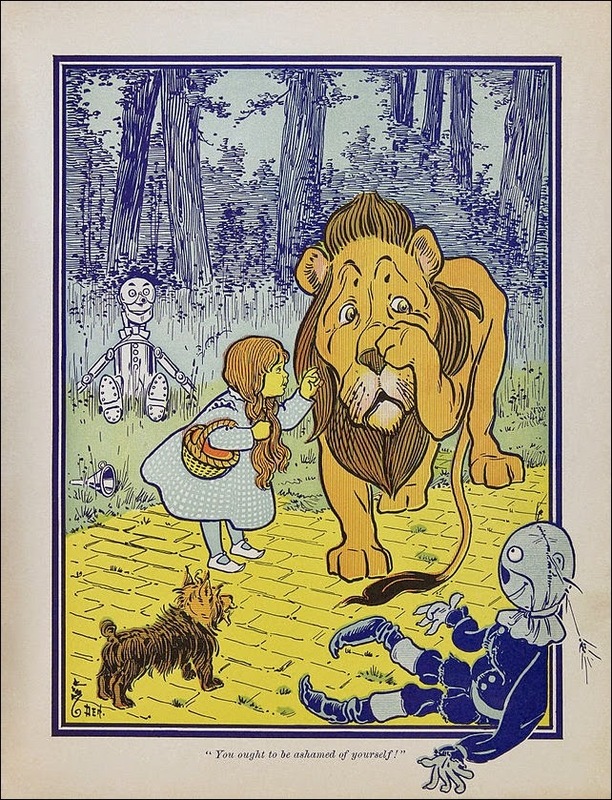 This was strange, to say the least, especially as the author of The Wonderful Wizard of Oz had died in 1919. Later both Baum's widow and his tailor confirmed that this was actually his jacket. So of all of the jackets, in all of the world, the one they chose for Frank Morgan to wear had once belonged to the original writer of the character he was playing. Quiet remarkable! As an aside, it's interesting that we could see the Yellow Brick Road as being like the journey through life, where we have to overcome our self doubts and fears as we head towards the Emerald City. 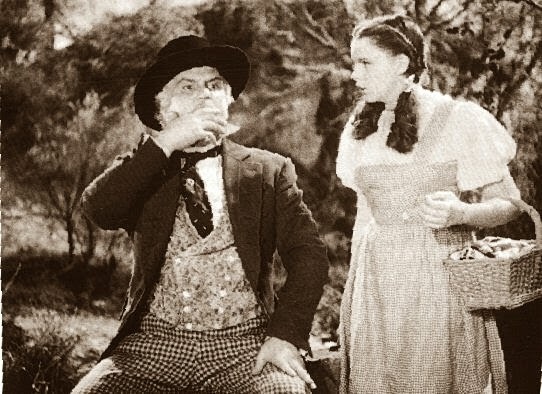 In The Wizard of Oz the Scarecrow believes that he has no brains (though he comes up with clever solutions to several problems that they encounter on their journey). The Tin Woodman believes that he lacks a heart (but is moved to tears when misfortune befalls the various creatures they meet). And then there is the Cowardly Lion who believes that he has no courage (even though he is consistently brave through their journey). So by the end of their journey, the Scarecrow, the Tin Woodman and the Lion attain self-fulfillment. As Carl L. Bankston III of Salem Press is quoted as saying: "These three characters embody the classical human virtues of intelligence, caring, and courage, but their self-doubts keep them from being reduced to mere symbols of these qualities." 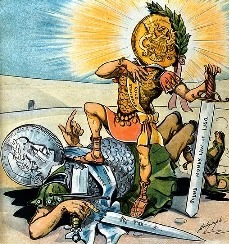 In his 1964 American Quarterly article, 'The Wizard of Oz: Parable on Populism', Henry Littlefield posited that the book contained an allegory of the late 19th-century bimetallism debate regarding monetary policy. 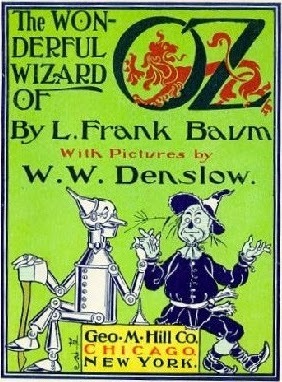 At the beginning of the novel, Dorothy is swept from her farm to Oz by a cyclone, which was frequently compared to the Free Silver movement in Baum's time. The Yellow Brick Road represents the gold standard and the Silver Shoes which enable Dorothy to travel more comfortably symbolizes the Populist Party's desire to construct a bimetallic standard of both gold and silver in place of the gold standard. She learns that to return home, she must reach the Emerald City, Oz's political center, to speak to the Wizard, representing the President of the United States. While journeying to the Emerald City, she encounters a scarecrow, who represents a farmer; a woodman made of tin, who represents a worker dehumanized by industrialization; and a cowardly lion, who represents William Jennings Bryan, a prominent leader of the Silverite movement. The villains of the story, the Wicked Witch of the West and the Wicked Witch of the East, represent the wealthy railroad and oil barons of the American West and the financial and banking interests of the eastern U.S. respectively. Both these groups opposed Populist efforts to move the U.S. to a bimetallic monetary standard since this would have devalued the dollar and made investments less valuable. Workers and poor farmers supported the move away from the gold standard as this would have lessened their crushing debt burdens. The Populist party sought to build a coalition of southern and midwestern tenant farmers and northern industrial workers. These groups are represented in the book by the Good Witches of the North and South. 'Oz' is the abbreviated form of ounce, a standard measure of gold. Of course The Wonderful Wizard of Oz might simply be a story for children! The political interp for the story sounds like a stretch to me. But the synchronicity with the coat and Baum is one of the classics! The jacket / coat is a great example. That is an insane coincidence about the jacket. As for me, no political interpretation wanted, it's a storybook! You are probably right, sometimes we read too much into things.